Those who prefer inframammary do so because they are afraid of the pain. 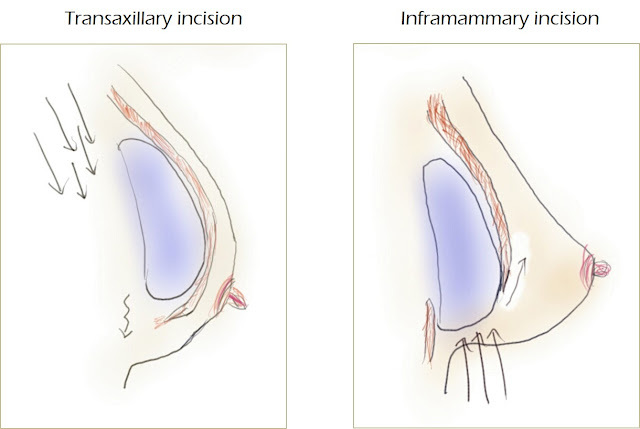 Those who prefer the axillary do so because they want to hide the scar that may be caused. 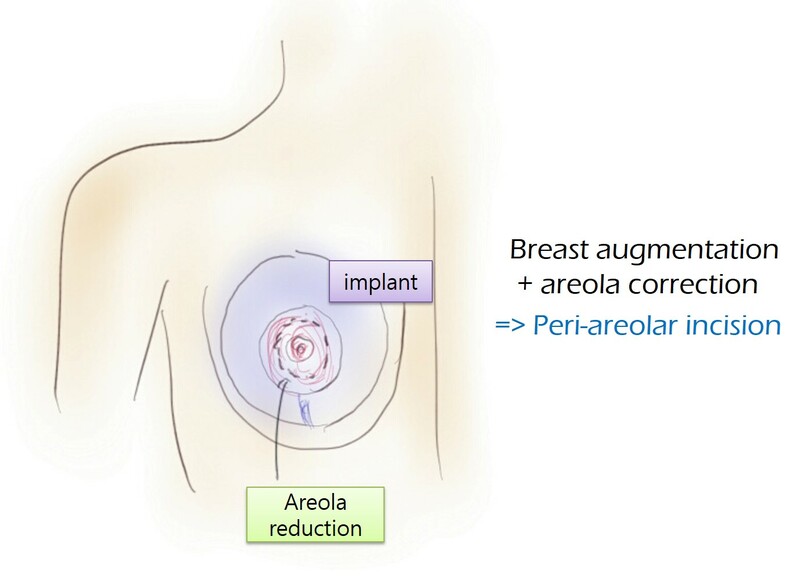 Those who prefer peri-areola do so because they want to avoid both inframammary and axillary incision. 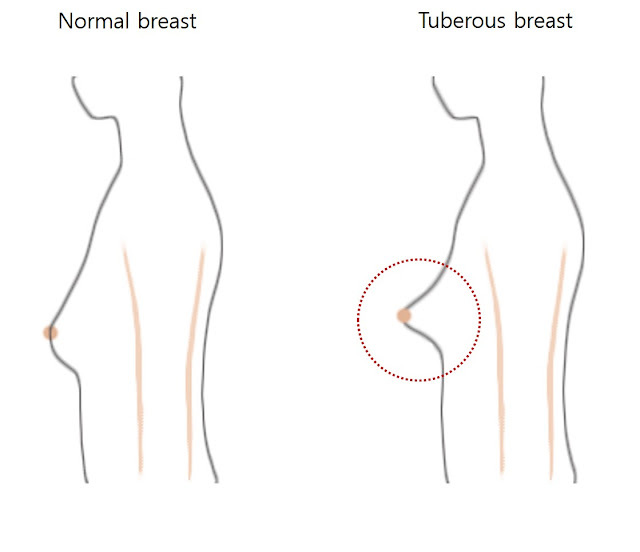 Tuba is selected because the patients want the incision to be done at a spot that is far from the breasts. All these incision methods are good methods that have been proven over time. Most patients can get the incision that they want. It is hidden therefore you do not have to worry about the scar. On the contrary, peri areolar or Inframammary fold technics are perfect due to the direction of the dissection is ideal for dual plane. Here is an another example. It is the constricted breast or the tuberous breast. 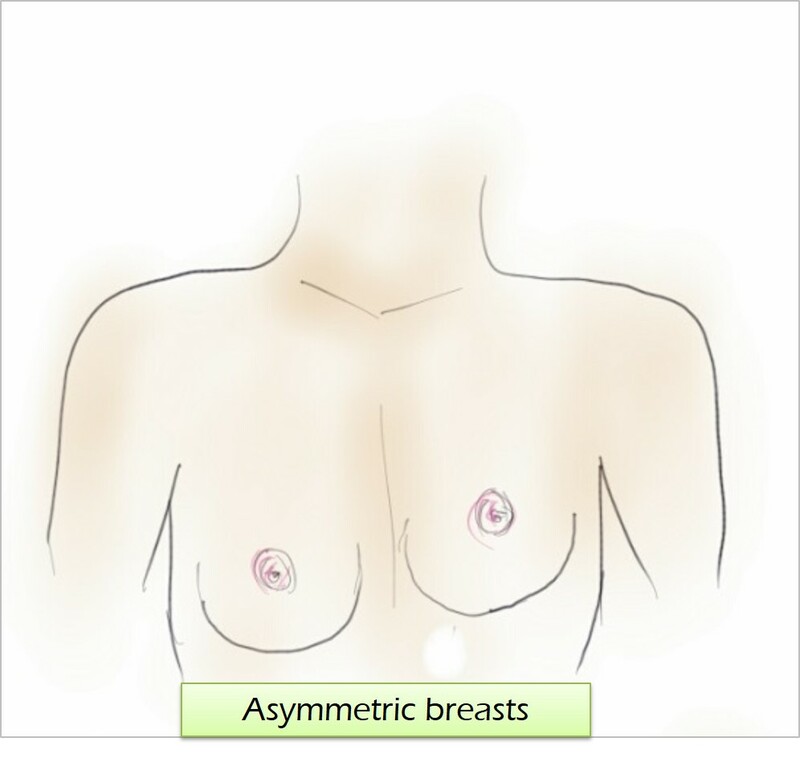 When a tight implant enters the breast, you need to spread out the bottom breast tissue. 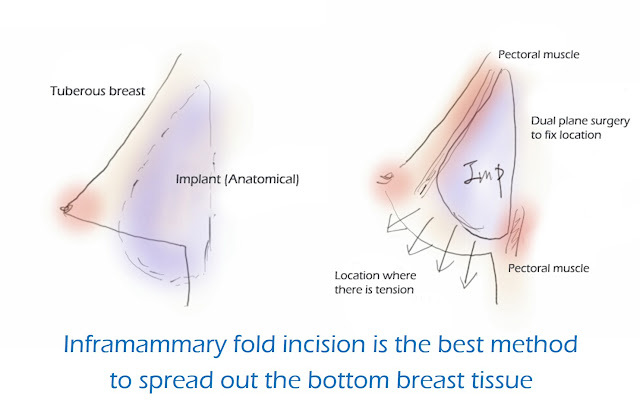 Inframammary fold incision is the best method to spread out the bottom breast tissue. and areola correction, then the best method would be peri-areola incision. Same applies when you do breast lifting through the areola. 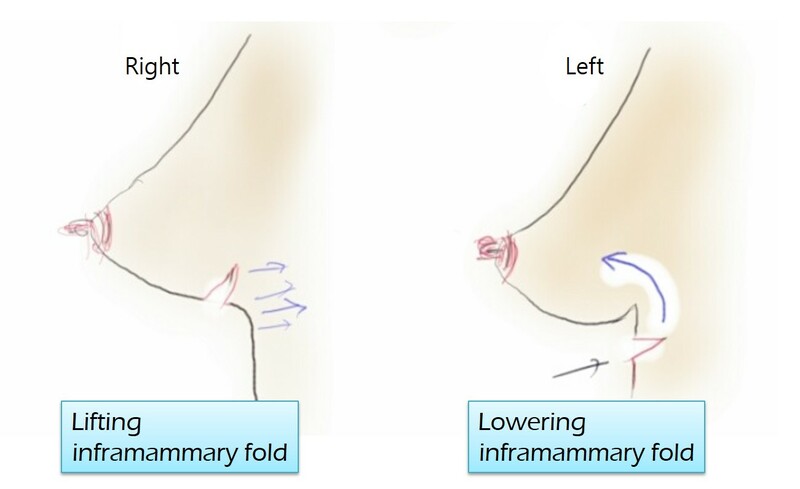 You need to remove the original inframammary fold if you want to fix asymmetric breasts caused by asymmetric inframammary fold or areola. 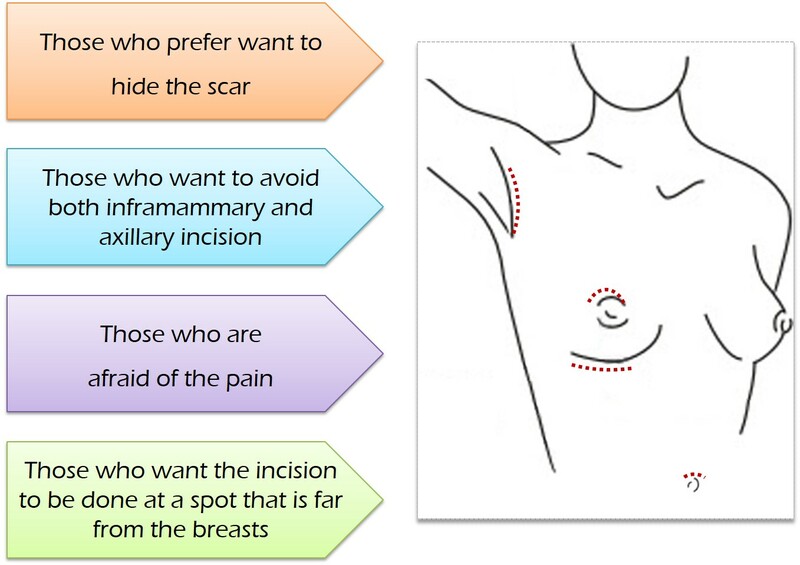 What are the advantages and disadvantages of each of these incision methods? 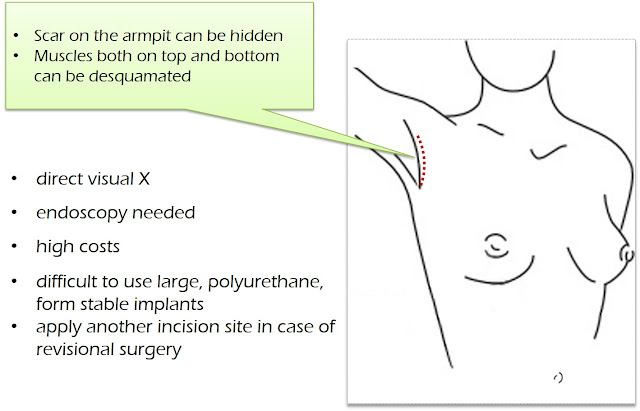 The scar on the armpit can be hidden when conducting the axillary incision and the muscles both on top and bottom can be desquamated. But there is no direct visual therefore the surgeon needs to use the endoscope which leads to high costs. Also it is difficult to use large, polyurethane, form stable implants. If you need a secondary surgery for correction, we might have to apply another incision on other spots. would be more accurately conducted and there is less chance of damaging important nerves and vessels. It can also be simultaneously conducted with lifting. 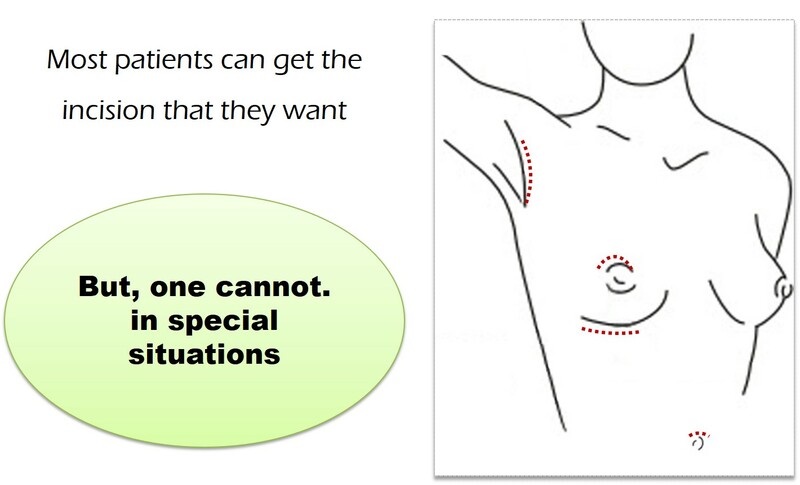 The disadvantage is that it is not satisfying for those who are concerned with scar around the areola. Also the size of the implant is limited to the size of the areola. and there is also a possibility of infection. Inframammary fold incision is quick, accurate and has direct visual. The patients feel comfortable after the surgery and dual plane or any other plane methods can be applied. The disadvantage is that the scar is exposed if you have opened inframammary fold. Also you need to decide on the new location of the inframammary fold before the surgery.